A stylish gift for the special man in your life, this Men's Italian 14K two-tone gold satin and polished design bracelet from Apples of Gold Jewelry features two different gold colors coming together in a two-tone look. 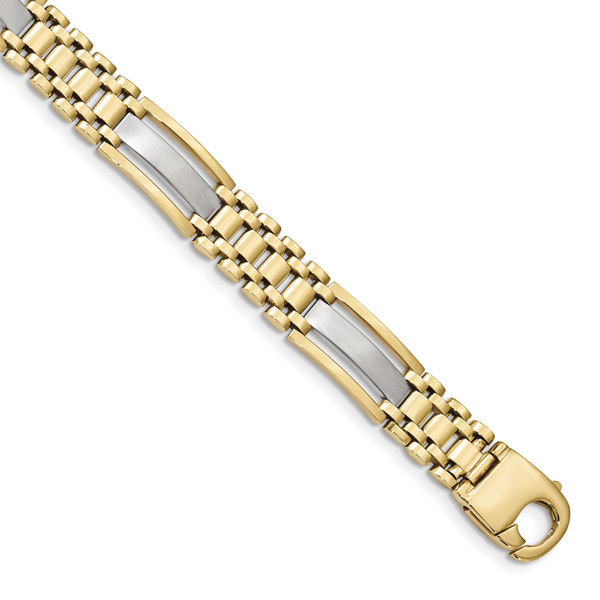 The 10.2mm wide bracelet measures 8.75 inches in length, with a weight of approximately 21.37 grams of 14K solid gold. Made in Italy, this bracelet features a designer lobster-claw clasp that is just as stylish as the rest of the bracelet! The 14K yellow gold chain features small bars of 14K white gold in the center of each. The bracelet has both polished and satin finishes. We guarantee our Men's Italian 14K Two-Tone Gold Satin and Polished Design Bracelet to be high quality, authentic jewelry, as described above.